I do not know exactly what year the Clifford’s moved into Laindon I know it was before the 1930s, they originally lived in Plaistow. Great granddad Joseph Clifford was born on the 24th February 1862 in Plaistow. 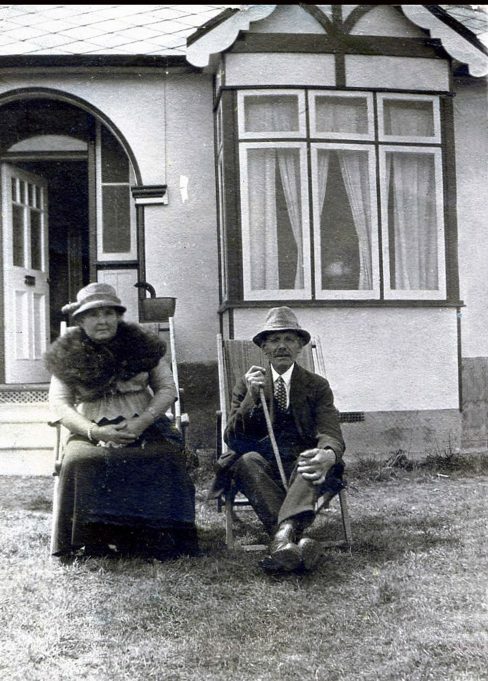 He married Agnes Jane Allsopp born 28th June 1866 in Limehouse on the 9th August 1885 at St Andrews Church, West Ham. 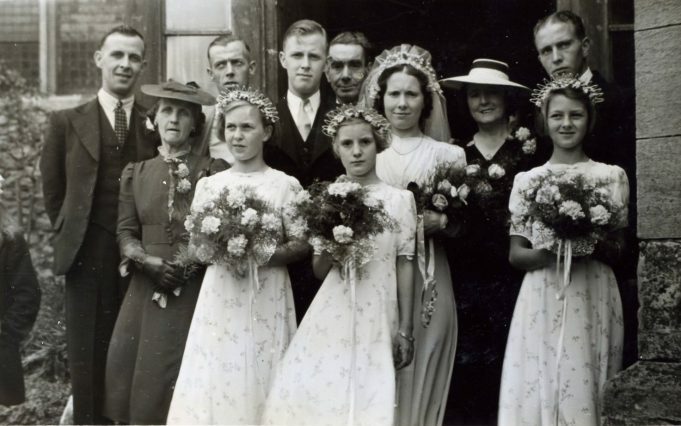 They had 11 children all born in Plaistow. He was a master carpenter and he built Belgrave bungalow on Laindon High Road somewhere between King Edward Road and Victoria Road (near to North Parade Post Office). Maybe near where Roberts Road now joins the High Road. I was a school child last time I visited the place. He also built two others called Kudos and Yardley, they were further back off the High Road, but I do not remember them. My mother often talked about them as they were all very similar. Mum was born at 37 Belgrave Road which is why he called his new bungalow by that name. I was 5 or 6 when he died in the early 1950s, Agnes died several years earlier. His youngest son Sidney who was married to Grace MacDonald owned and ran the green grocers shop on the Laindon High Road approximately where Roberts Road now joins the High Road. I remember it well it had a centre door and produce each side out front, it had a large concreted front and the stream which ran all the way along the High Road ran at the front underneath. This is a fact as I on many occasions was sent by my mother to buy our vegetables. Great Granddad and Uncle Sid owned many greenhouses to the rear where he grew his own produce. The Sofa Bed shop used to be called Buckingham’s Butchers, I shopped there too. Just before the war broke out one of their 11 children, my nan Grace Mary Clifford born 22nd July 1889 in Plaistow, moved to Laindon as well. She was married to Arundel Thomas Webster Pryor and their house was called Apna Ghur. This house was sited in front of the Manor Mission. The garden was huge on the side and to the back, and this ran parallel to the Mission. My mum Vera Florence Pryor was married from this house on the 17th August 1941 at St Nicholas Church. Her father Arundel was also born in Plaistow but loved living in Laindon. He was great friends with Joan Sims father and they used to go drinking together as the Laindon Hotel and the Fortune of War. This is a story mum always told us as nan used to get cross with him. Dad Reginald Frank Boatwright born in 1917 Canning Town, came to live at Apna Ghur as the war had just begun. When he was later drafted into the Royal Signal Corp. mum stayed living with nan and granddad Pryor. Later in 1946 I was born in Apna Ghur, so was my brother Peter. I remember Laindon very well. Dad used to pass me over the back fence to the Manor Mission for Sunday School and Sun Shine Corner a children’s class with Bible stories and singing. 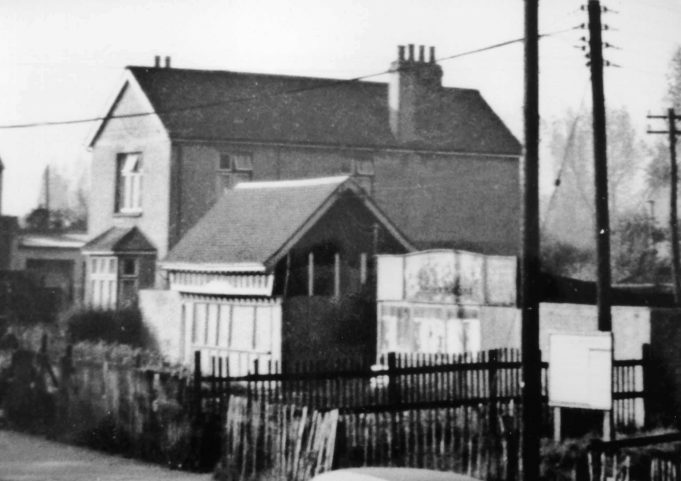 When dad came home from the war we were given one of the ‘New Prefabs’ on Railway Approach made for the men coming home from the war with families. There we stayed for a few years, I went to school at Langdon Hills Primary School. We later were moved to a brand new council house 21 Pound Lane, when I was 6, next door to Ken Porter. For my sins he is like an adopted torment of a brother. The timber yard was next door to Apna Ghur and the Coal place was opposite, I used to visit and old lady in that house across the road called Mrs Gibbons, she gave me sweets. I tasted my first butterscotch sweet from her. Arundel Pryor served in India for a time which is where the house name comes from. Joseph Clifford (I have said before) was a master carpenter and worked on many a bungalow in Plotlands as I believe it is now known. He also did the carpentry on the original bungalows on Basildon Drive and the bungalows that then replaced them in 1935. The original small sizes, with privy outside. I can never prove this of course but my mum always said her granddad helped build these places and would never build anything else but bungalows on this Essex clay soil as the clay led to subsidence. He would have been surprised to see the present houses thanks to the pile drivers and deep foundations that now enable houses to be stable. I live in one of the original bungalows with extensions now of course to make an indoor bathroom. I would like to think that he would love his great granddaughter living in one (but with all new double glazing of course). Every Saturday morning I used to walk from Pound Lane to the Memorial Hall on the High Road to do ballet classes taught by Miss Taylor. I danced with Pearl Penson and Fred her older brother. Do you remember the church annex, it was either St Peter’s or St Paul’s on Nicholas Lane, just up from Hiawatha? The other side was the other Biblical name but a hall. We used to hold a lot of jumble sales in that hall. The other side, the church, was where my mum was “Churched”, (that doesn’t happen any more) because living on the High Road and later in the prefabs, the annex was more convenient than St Nicholas. Below are some additional family photographs. Just had to write and say thank you for this web-site. 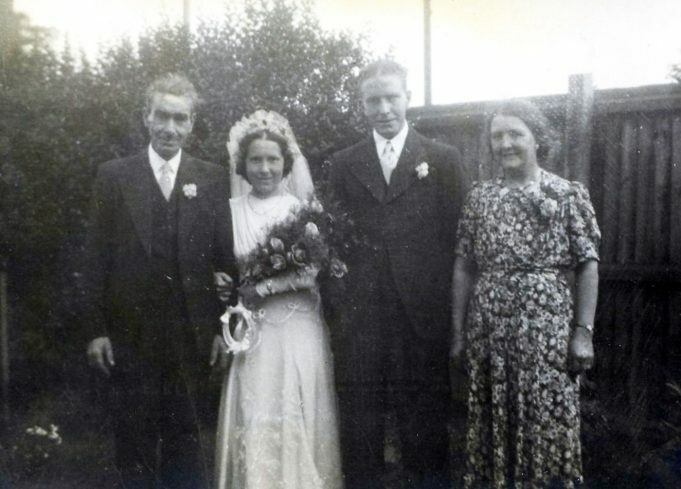 Because of this site I have found my cousin Margaret and her brother Clive after 52 year. The only Clifford line I had not been able to trace on my family tree. 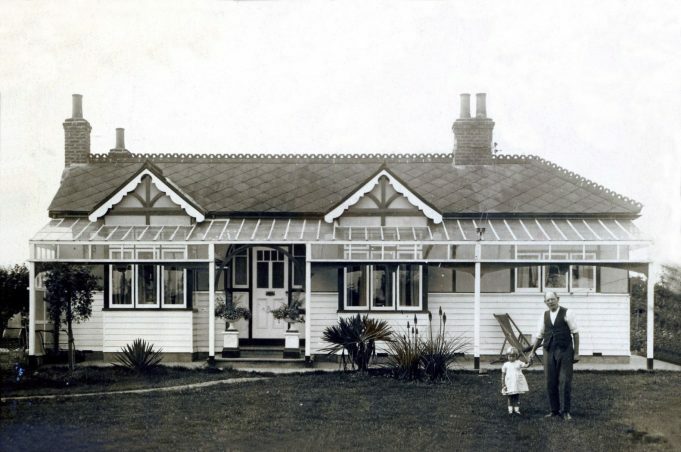 Great Granddad Clifford did build the bungalow, he lived in it until his death. Then his youngest son took over Sid Clifford who also owned the green grocers shop next to the plot of land. Uncle Sid moved out when his daughter was 14 (she has just told me) so that makes the year around the 1960’s. What happened to the property after that I do not know. I had always guessed that the up and coming Basildon Council compulsory purchased the land, but maybe someone else lived there before they raised it to the ground. Met Clive Clifford at Asda checkout with Margaret. We shared Markhams Chase and were both bikers at Southend on Sea. (He was unaware of your Laindon History site; he looked well and strong handshake!). I am so sorry folks but I have not logged onto this site for a few months now. I have been so busy, as they say once you retire your time is not your own. Wow, I am overcome with excitement, is that really you cousin Margaret. I have left messages on Genes Reunited and all over trying to get in touch with you. Please I should love to know more about you and your family and Clive. I did hear the rumours that you mum and dad had passed away but was still hopeful we would make contact. What I have written on this page is all that I remember from my childhood. I do not know details and who owned what it was never my business to understand the way things were. I remember the shop and Uncle Sid running it, I remember all those green houses and the vast expanse of land all around it. Mum filled me in on some of the happenings but I was too young to know much. Hi Alan, sorry I do not know these things you are writing about. I only knew that Uncle Sid ran the greengrocers and mum said he owned it. Maybe he bought it from Mr Baker? I was very young so I was not interested in these things. I do not even remember reading the sign above the door I am afraid. Maybe as I have now made contact with his daughter Margaret she might shed some light on the details. I am thrilled to think she has read this article and has made contact, it is what I had hoped for for such a long time. I have not been back to Laindon for many years but, from the various comments, it would appear that Roberts Road has been extended to the High Road. Presumably this extension would have gone straight through the nursery at the back of Cliffords and through Cliffords store which was next door to Hatheralls hardware store. Hatheralls in turn was next to the four or five semi detached houses south of Pelham’s alley. As a youngster I worked in the nursery at the back of Cliffords store on a Saturday morning. I worked for old Mr Baker who ran a one man band and whose produce was sold in the store. The faded sign over the store read G.A.Baker and S.Clifford. Since his name came first I always assumed that Mr Baker was the senior partner. Apparently not. I never worked in the nursey to the south which ran along the High Road from Cliffords to the post office. This leads me to believe that a different business relationship existed there. Something of which Mr Baker was not part. Mr Baker lived alone (I do not think he had any family or ever married) in a very modest bungalow in the first street that ran parallel to the High Road to the west, literally at the back end of the nursery. I forget its name. Valerie, do you know how old Mr Baker fits in to your story? According to the 1949 Electoral Register, George A Baker lived at No 19 Tattenham Road. It has been very moving for me to read the history of my family, thank you. Belgrave was a wonderful house to grow up in, and I have very good memories of my childhood in Laindon. This history has been so interesting and I would love to know more, as Sid and Grace (mum and dad) died not many years after leaving Laindon. To John Bathhurst, you mention that there may be a family connection with the Pryors, please get in touch with me as I am very interested in my family history and should like to find a link. The way that Pryor is spelt is not the usual way, Prior is normal and in fact I also have a grandmother Rachel Prior married to Charles Clifford. Pryor seems to come from Cornwall but so far I have only traced them coming from Kingsbridge Devon. Thank you John for your comments. I know that granddad Joseph Clifford (who died in 1952) were the only family along with his son Sidney to live in Belgrave. One of my pictures with the lady in front holding the red setter called Rufus. She was my mother Vera Pryor. She married Reggie in 1941. The three Clifford girls on a picnic are Annie, Grace (my grandmother) and Florrie, I remember them all so well. Grace’s husband Arundel Thomas Webster Pryor died on the 17th May 1946 and I was born five months later in October. I think Ian Mott (our editor) has a picture of Yardley, I was so surprised to see it and it was in a totally different place to where I thought it was. Maybe the third bungalow Joe Clifford built called Kudos (I am not totally sure about the spelling) was the bungalow next door? I did ask my mum quite a lot of questions when she was alive about her past and our heritage and my own family history. I am into my ancestors in a big way, going back to 1781 with the Pryors and 1774 with the Cliffords. The veranda must have been put on at a later stage because I cannot remember it without. When I used to visit Auntie Grace and Uncle Sid it was always the same, and well lived in. This is the only family I have not been able to make contact with during my research. The last I heard of Clive and Margaret (Sid’s children) was they had moved to Norfolk. I would be very pleased to hear from anyone regarding my family. There are so many interesting parallels between part of my own family history (the Vickery’s) and that of Val Kingsley’s given in her account, not least the move of her great grandparents to Laindon from the same area of east London, the self building of their Laindon home and even the link with the surname Pryor in that precise spelling that one wonders if there is a family link. However, as is well recognised, there are very close links between the “Plotlands” families who inhabited Laindon and its environs (Langdon Hills, Dunton and Lee Chapel) and those families of east London, which are inevitable given the strenuous efforts of the land agents who had bought up the redundant farmlands on which Laindon was built. The agents advertised their cheap building plots in every conceivable way they could think of to the east Londoners and achieved a fairly heavy degree of success in the 1920s because so many living there had secured a moderate degree of prosperity out of the increased industrial effort required by the 1914-18 war. Investing in land and/or property seemed such a good idea at the time. I suspect that, the more people enquire, as Val Kingsley has done, into their Laindon roots the more such common links will be found. For her information, her great granddad, Joe Clifford was still living in “Belgrave” in Laindon High Road in 1949 as he approached the centenary of his years which says something, perhaps, about the Laindon environment! But I wonder why, and when, the delightful veranda on his bungalow had been demolished? The other dwelling he had built, “Yardley” was right next door and (sorry, Bill) it was in Yardley that, in 1949, George Brockwell, railway road delivery agent, and his wife Emma resided.. In that same year, “ Apnur Ghur” is recorded as being occupied by Reg and Vera Boatwright, which fact confirms everything that Val has to say about her birthplace except that, like so much that was significant to the Plotlands era, it no longer exists. The photo of Belgrave in the High and the location described reminds me that it was possibly occupied by a Mr.Brockwell who was a local carrier employed by the railway to deliver goods sent by rail. Also the house did have the Sid Clifford nursery next door on the right when facing.